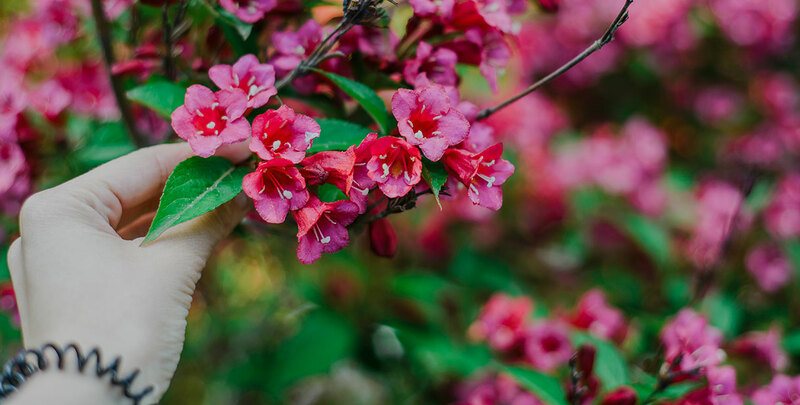 Weigela is a small genus of deciduous shrubs, which can be identified by their gracefully arching branches, their simple, ovate and toothed leaves and especially their clusters of funnel-shaped flowers that appear in late spring and early summer, from May to July. Weigela species have been around for a long time and used to be a highly popular ornamental plant during the Victorian era – the undisputed heyday of the weigela. Once the flowering season is over, weigela species offer very little interest, but this is generously compensated for by its profuse pink, red or white flowers, which appear on fully grown specimens. Weigela are great as informal hedges or as a border shrub, offering a leafy and flowery backdrop for other border plants. Its non-scented flowers are of course the main feature of weigela species. These showy blossoms grow from dark red buds on the older branches of the plant. Depending on the variety you choose to plant in your garden, the flowers will grow alone or in groups. Some varieties have variegated leaves, which add some more interest to these handsome shrubs. Since the discovery of the plant, many cultivars have been established, most of which were developed for the purpose of making their beautiful flowers stand out as much as possible. A weigela hedge will certainly make your garden stand out during flowering season. It is also possible to use this species as a component of mixed hedges with other flowering hedging plants. While the genus was named after the German scientist Christian von Weigel, all weigela species are native to East Asia. Halfway through the nineteenth century, the renowned Scottish botanist Robert Fortune introduced the first weigela species, the weigela florida, to British gardens after taking it with him from China. The plant was immediately appreciated for its striking appearance and quickly became a popular garden plant all across Europe and the UK. 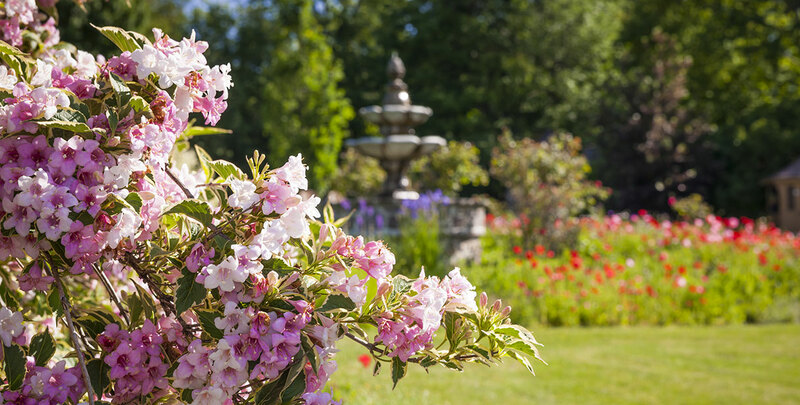 After the opening of Japan to the West in the 1850s, European growers and garden enthusiasts travelled to the country in order to find more species of weigela, as the plant had become one of the most sought-after ornamental plants in the UK during the latter half of the nineteenth century. The popularity of weigela species did not vanish after the Victorian era, however. In fact, weigela species are still highly appreciated by anyone looking to add a little colour to their gardens. Since the plant offers very little in terms of usable wood or edible fruit, which is a dry capsule, nurseries all over the world could focus solely on accentuating the aesthetic value of weigela species. As a result, some of the cultivars available today may even have more beautiful flowers than the ones that Robert Fortune introduced to British gardens a century and a half ago. Weigela species today are every bit as much of an eyecatcher as they were back then – if not more. The average growth rate of a weigela is 20 to 40 centimetres per year, so it may be necessary to shape your weigela every once in a while, especially when you have opted for a variety with a relatively large growth habit, such as the weigela ‘Rosea’, which can reach an ultimate height of 2 to 3 metres. 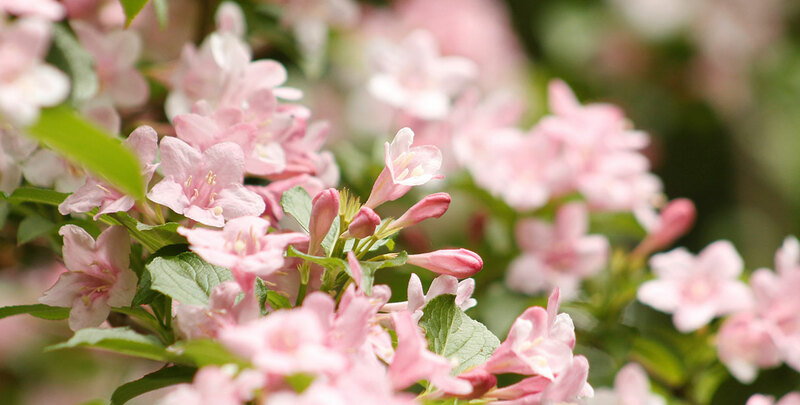 Pruning is necessary not only to slow down its annual growth; it will also stimulate flower production, as weigela species only produce flowers on new wood. The perfect time for pruning a weigela hedge would be during the winter months or directly after flowering, when the shrub is dormant. Cut back up to a quarter of the shrub in order to create the shape and appearance that you are after. Weigela species are easy to grow and very hardy. They will handle dry and shady positions and even exposed locations are tolerated, but they will do best when planted in the full sun to partial shade in a moist, well-drained soil. If the soil in your garden is poor and sandy, we highly recommend you add some compost or fertiliser prior to planting your weigela hedge. Species from this genus make excellent hedges for informal hedging, but they will not make a dense screening or privacy hedge. A weigela hedge cannot be kept particularly tidy and neat, but most people choose to plant this hedging plant in their gardens for their wild, natural look, so this should not be a problem. 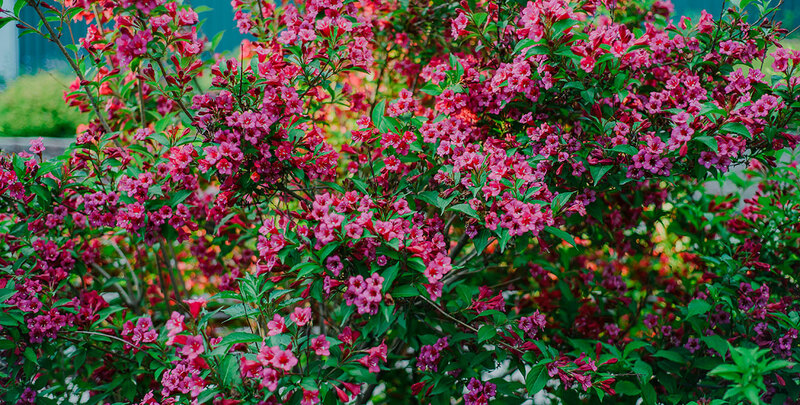 Due to its popularity during the Victorian era, weigela is commonly viewed as a classic ornamental plant. However, a weigela hedge will look just as good in a contemporary informal garden. Weigela is simply a timeless hedging plant. In addition, it will colour any garden without much effort. Weigela species are very easy to grow and not very demanding when it comes to position and soil type. While pruning is necessary in order to encourage flowering, a weigela hedge is very tolerant of pruning and the job can be done without much trouble. Weigela species are therefore not only undemanding, but also fairly low maintenance. Since its introduction to gardens in our part of the world, weigela species have consistently been a component of flowering hedges all across Europe and the UK. Often as a part of mixed hedges, but as a single species hedge, the ornamental value of the weigela is simply undeniable.